In the century and a bit since the art of film making has developed and constantly evolved, (some may argue, too much, to the point of losing its initial magic) there are many films that have touched the imagination of cinema goers everywhere. That magic doesn’t always remain however as the near destruction of all original copies of the seminal cinema classic Nosferatu attests. 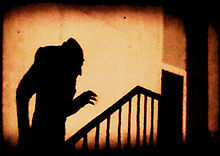 Following the demands of Bram Stoker's estate, all copies of Nosferatu were ordered to be destroyed following a plagiarism suit. Luckily, not all the copies suffered that terrible fate. As much as we love the original Dracula story and it’s various official cinematic outings, we can’t help feel that Nosferatu truly embodied the terror the original story wanted to pass on to the reader. Director FW Murnau creates a film that is watchable on so many levels that it never loses the sense of sheer enjoyment. Every frame of the film, in contrast to the many multi hour silent epics of the decade, is designed to do something important for the film and with a cast that exudes the right amount of enthusiasm the right ingredients are in place. Perhaps the key ingredient is the wonderfully mysterious Max Schreck, portraying the supremely creepy character of Count Orlok. The fact that little is known about the actor given the time since the film was released makes it even more of a chilling performance and if the rumours that the actor ‘lived’ the role are true then we should be grateful that it has survived to be enjoyed almost a century later. But in an age of constant creativity, the ability to release a film of even the most basic quality literally in our hands, why should we appreciate the occasionally primitive work on display in Nosferatu? The answer is simple; yes, there are obvious limitations to the film on occasion but don’t let that put you off the basic point that it has lost none of its edge. The camera work is crisp, not a shot wasted or lingered on for too long and the central performances are, by the sheer universality of silent cinema, open for all to interpret. Recent issues of the film on DVD and Bluray have been remastered and re-scored, some versions even featuring a rerecorded approximation of the original live music that accompanied the film’s screenings. Whichever version you watch, (and there are many out there, official and unofficial), you’re sure to be enchanted. The sheer beauty of the then Weimar Republic is clear to see even in monochrome and the intertitles describing the action and dialogue are things of beauty. Words by themselves are an art form but the extended screen time that silent cinema afforded them truly made it a multi-literal experience. There is a reason that silent cinema classics such as Nosferatu have remained popular and that is the craft that went into their making is clear to see. Although many film makers may prefer colour for the sheer number of options it gives, monochrome wins out in that it is truly beautiful by nature of the sheer minimalism involved. We could talk for a very long time about the excellence of Nosferatu but we think we’ve made the point already. Although many of director FW Murnau’s films now no longer survive in any archives, potentially awaiting discovery in some unexpected place, we should be thankful a handful did, including this wonderfully atmospheric vampire tale now synonymous with silent cinema as a whole.